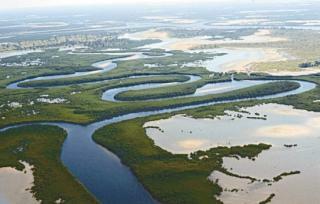 The Saloum Delta is representative of a traditional coastal lifestyle of shellfish gathering and fishing. The site is marked by 218 shellfish mounds, some of them several hundreds metres long, produced by its human inhabitants over the ages. Several of them hold funerary sites (tumuli). The oldest shell mound dates from 400 BC, the creating of tumuli occurred between the 8th and the 16th century. The area, which is also a Ramsar Convention site, lies within a 180,000-hectare biosphere reserve within the delta of the Saloum, Diombos and Bandiala rivers. Waters comprise 61,000 hectares of the park, intertidal mangroves and saltwater vegetation cover 7,000 hectares, and savanna and forest cover 8,000 hectares. It lies on the East Atlantic Flyway. Some practical info (site visited in April, 2018). The best place to start exploration of the area is a small town of Toubacouta (frequent local buses or sept-place from Kaolack, main road Kaolack - Karang - Gambian border is a basic transportation artery from Senegal to Gambia). Toubacouta has some descent number of hotels / hostels, shops, restaurants so its an ideal base for visiting the area. 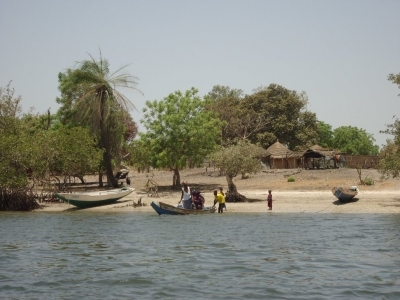 The only way to reach Saloum Delta is to take a boat. There are usual two types of trips offered by local people: southbound trip from Toubacouta to Sipo village (typical Delta village located on artificial mounds made of millions of shells). In the village - around 30 huts you can visit any place as well as buy local products (honey, souvenirs). Trip include visiting some canals with mangrove vegetation as well as local birds. Both trips costs 15.000 CFA each and takes 3-4 hours depending on the time spent in the village / island. During the trips you should have your own protection against the sun (boats are uncovered). Take also plenty of water and some food with you. Comparing to other places in Senegal it is one of the most interesting area and relatively unchanged. People still rely on fishing and ostrige collection, transportation is done by boats, huts are built from local materials (wood, straw, clay). Mounds made of shells are quite impresive and high. We had our hotel in Toubakouta in the Saloum Delta. From there we did a bird walk along the river. Also a boat trip in the evening to see the birds come back to their sleeping place. IUCN recommended no inscription - did not meet any natural criteria - should go for Ramsar/World Biosphere instead. ICOMOS were ok with cultural inscription. Some WHC members supported IUCN, some (e.g SA, Egy) wanted referral, some wanted deferral. Secret ballot 11 against 10 was in favour of referring the Natural nomination for more studies on Bird life. On National Border: With Gambia: a. . The Wiki entry for Gambia's Niumi NP states "The park is contiguous with Senegal's Delta du Saloum National Park and Biosphere Reserve." b. The AB eval for Saloum states "it also includes the coastal marine area from the mouth of the Saloum River in the northwest,to the Gambian border in the south." Built in the 11th century: "The creation of tumuli on certain large shell mounds ... started in the 8th century AD and developed through to the 16th century. Various populations occupied the islands in the Saloum Delta one after another: Fulani, Tukulor and Serer in particular. The latter arrived in the 11th century from modern northern Senegal fleeing the Almoravid conquest. They erected large tumuli and they are still the dominant ethnic group in Saloum." Controversial at inscription: IUCN recommended no inscription - didn't meet any natural criteria - should go for Ramsar/World Biosphere instead. ICOMOS were ok with cultural inscription. Some WHC members supported IUCN, some (e.g SA, Egy) wanted referral, some wanted deferral. Secret ballot 11/10was in favour of referring the Natural nomination for more studies on Bird life.